The Best Pottery blogs from thousands of top Pottery blogs in our index using search and social metrics. Data will be refreshed once a week. Also check out Top Pottery Youtube Channels list for Top videos on Pottery. Pottery newsletter is a comprehensive summary of the day's most important blog posts and news articles from the best Pottery websites on the web, and delivered to your email inbox each morning. To subscribe, simply provide us with your email address. San Francisco, CA About Blog Anything and everything related to throwing, hand-building, sculpting, glazing and firing . Facebook fans 1,062,609. Twitter followers 455,830. United States About Blog All about pots, vases, pots for pouring, pots for drinking, pots to serve from, pots to eat from, pots that are candles and pots that are lamps. It consists of mostly gas fired stoneware, along tiles. Facebook fans 1,677. Twitter followers n/a. Facebook fans 740. Twitter followers n/a. Washington, United States About Blog Pottery and ceramic art illustration by Kim Murton. Port Moody B.C About Blog A blog about earthenware art, stoneware clays and electric kiln to fire the earthenware work. Seagrove, NC About Blog Posts by Michèle Hastings, a full time studio potter who creates unique, art pottery for daily living. Contemporary stoneware, porcelain, sculpture, including wood-fired, salt-glazed and raku. Facebook fans 862. Twitter followers 154. Washoe Valley, Nevada About Blog Clay stamp, free hand slip and inlay pottery designs done by wheel thrown or handbuild. Facebook fans 870. Twitter followers 816. Facebook fans 266. Twitter followers 79. Minnesota, USA About Blog Grey Fox Pottery makes custom ceramic coffee mugs, including custom beer steins and custom coffee mugs and tankards with your logo or artwork. Facebook fans 377. Twitter followers 39. Mountain View, CA About Blog Google News feed for everything pottery. Facebook fans 21,666,167. Twitter followers 212,643. New York City About Blog News, commentary and archival information about ceramics and pottery from The New York Times. Facebook fans 12,851,951. Twitter followers 32,884,046. San Francisco Bay Area About Blog With the most California Certified Nursery Professionals in Northern California, Sloat Garden Center provides with a wide selection of pottery. Facebook fans 4,477. Twitter followers 1,461. About Blog Pottery classes for adults and kids in NYC and providing a welcoming environment for beginners and advanced potters. America About Blog Ephraim Pottery is the modern incarnation of the traditional artisan guild. They are guided by their hands, heads and hearts. Facebook fans 11,811. Twitter followers n/a. Hutchinson About Blog Clay Coyote's mission is to support emerging clay artists as they develop their skills and build their business. The perfect place to find a unique, handmade gift made out of clay. Facebook fans 2,429. Twitter followers 953. Facebook fans 3,167. Twitter followers 22. Asheville NC. About Blog Beautiful, original functional stoneware pottery dinnerware, serving, and home decor pieces. Hawaii About Blog This blog is primarily an educational site that informs and inspires potters, especially those who are new to the craft. For instance, this gallery starts with some of the earliest pots he made and continues up to the present so you can find out more information about how he made them, glazed them, and fired them. Woodseats,Sheffield About Blog Beautifully crafted handmade stoneware pottery like handcraft mugs, bowls and other tableware. by Tom Humphries made in a small studio in Woodseats, Sheffield. About Blog Florida Faience Gallery is owned and operated by Martin Cushman (Central Florida Art Potter) and Janet Crane (Wire Work and Wearable Art Jeweler). They wanted to create a relaxing environment where people can sit, talk, enjoy, and buy art from local artists. Bristol, IN About Blog Pottery, photography and design by Brandon "Fuzzy" Schwartz of Bristol. Facebook fans 228. Twitter followers 433. Facebook fans 170. Twitter followers 41. Utah, United States About Blog Mom Cave Pottery ab pottery blog by Lorraine is a ceramic artist, pottery maker and hobby potter. New Hampshire. About Blog A blog on Clay, Crystalline Glazed Works, Installation & Sculpture by Arryn. About Blog The musings of a ceramic artist, potter and design lover. Seagrove, North Carolina About Blog This blog is about their inspirations, studio activity, pottery life. The distinctive ceramic pieces are finely crafted studio art pottery with unique glazes and graceful forms. Bulldog Pottery proudly has on display our unusual, iridescent, crystalline glazes, with a distinctive luster surface. Facebook fans 2,220. Twitter followers 1,603. Redlands, CA About Blog Highly textured handbuilding methods of slab, coil and pinch pot. Facebook fans 269. Twitter followers 390. About Blog Inge Nielsen used to love to glaze with traditional Chinese reduction glazes, like jun, celadon and shino, but now work strictly in oxidation and my preferred glazes are oilspot, teadust and kaki/ iron red. Most of his clay teapots are unglazed to enhance the tea experience. About Blog Legalize Pottery is a ceramics studio based out of the San Francisco Bay Area that create slab, hand-built and thrown pieces. About Blog This blog focuses on pottery created at WillowAK Pottery in Willow, Alaska. The porcelain pieces created are handmade; unique; food, microwave, oven, and freezer safe; and wanting to be used and enjoyed. Washington About Blog A blog dedicated to the artist Liz Lewis of Vashon Island, Washington. Find information on Liz's upcoming studio tours, clay camps and events! Latrobe Pennsylvania About Blog Handmade pots for eating, drinking and planting. Facebook fans 163. Twitter followers 127. Taku, Saga, Kyushu, Japan About Blog A blog on Karatsu style stoneware pottery by Michael Martino. Facebook fans 1,181. Twitter followers 6. Australia About Blog Marian Williams have a passion for high fire glazes the old Oriental ones: copper reds, tenmoku, chun, etc. Facebook fans 1,250. Twitter followers 294. Charlotte, NC About Blog A blog about decorative stoneware for elegant entertaining and home decor. The stoneware pieces are fired in an electric kiln to Cone 5. Depth of color is achieved by layering on glazes using a variety of techniques. Facebook fans 665. Twitter followers 186. About Blog Legacy Pottery works create a variety of pottery and ceramic pieces, both hand-thrown and cast. All of their glazes are lead-free and food safe. Canada About Blog The functional pottery is wheel thrown and hand built and finished in a variety of glazes. The items it includes are mugs, dinnerware, teapots, casseroles, vases, drinking vessels and more. Facebook fans 4,344. Twitter followers 3,107. Aberdeen About Blog Juliet Macleod a studio potter make wheel thrown stoneware pottery for decorative or functional use influenced by my surrounding environment, particularly the sea. Facebook fans 1,921. Twitter followers 1,084. Facebook fans 1,362. Twitter followers 10. About Blog Garrity Pottery blog includes the whole making process of functional stoneware, mugs, vases, pots, n different pottery items. Tyrone, PA About Blog Posts on different types of pots such as burial urn, serving bowl, batter bowl with rolled rim and strap handle and chalice stems. North Shore of Lake Superior About Blog Rose crafts imcludes functional pottery, primitive decorative pottery, and ceramic sculpture. Each piece, a one of a kind, reveals the natural environment of the. About - ClayCraft is the perfect magazine for ceramic enthusiasts of all levels. About - A blog about studio ceramics, the artists exhibiting at Contemporary Ceramics Centre and their making history. About - I am a visual artist working in Preston, UK. I make pottery and paint, print and illustrate. 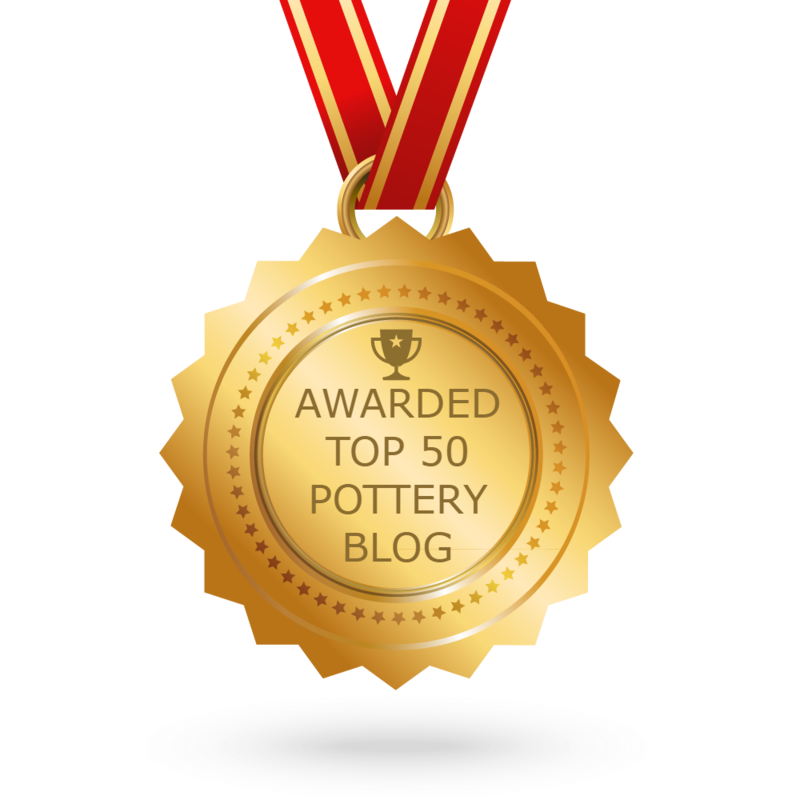 CONGRATULATIONS to every blogger that has made this Top Pottery blogs list! This is the most comprehensive list of best Pottery blogs on the internet and I’m honoured to have you as part of this! I personally give you a high-five and want to thank you for your contribution to this world.